Christmas Ornaments make great Christmas gifts. Specify your Christmas design and personal message. Personalized Christmas Ornaments are things remembered for years to come. Embroidered ornaments will be treasured for years to come. 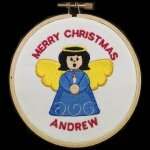 The embroidered angel Christmas ornament makes the perfect personalized Christmas gift. On this Christmas ornament, the colors for the angel will be the same as displayed unless you specify differently. NO TEXT will be embroidered unless you specify it. 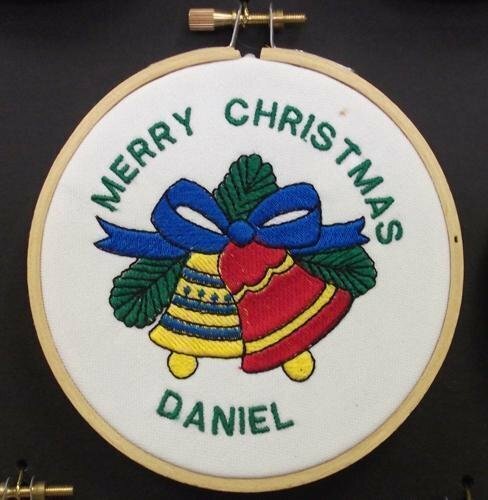 You can specify what to embroider on the top and bottom of the Christmas ornament and the color of the letters. 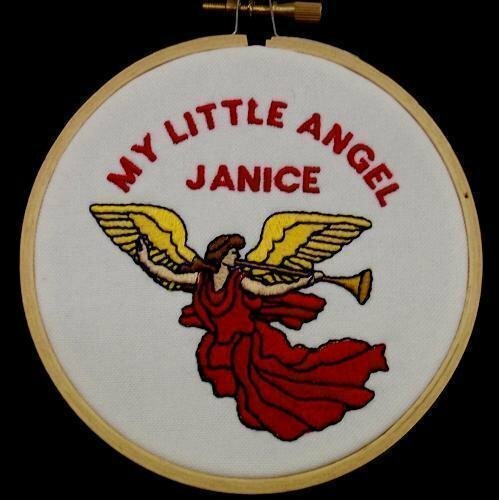 Please specify all uppercase letters as they embroider best at this size. Let us create a Christmas ornament for everyone on your Christmas gift list. Have a Merry Christmas! 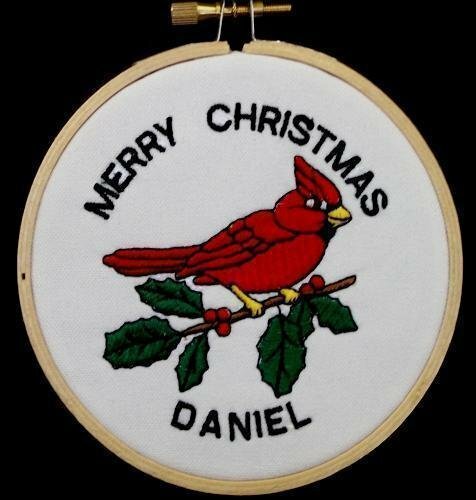 The embroidered cardinal Christmas ornament makes the perfect personalized Christmas gift. On this Christmas ornament, the colors for the cardinal will be the same as displayed unless you specify differently. NO TEXT will be embroidered unless you specify it. 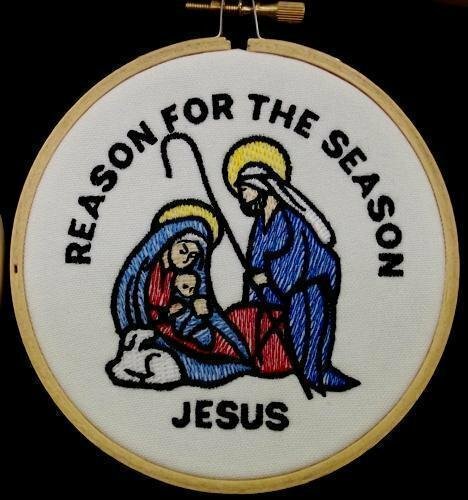 You can specify what to embroider on the top and bottom of the Christmas ornament and the color of the letters. Please specify all uppercase letters as they embroider best at this size. Let us create a Christmas ornament for everyone on your Christmas gift list. Have a Merry Christmas! The embroidered Christmas Bells ornament makes the perfect personalized Christmas gift. On this Christmas ornament, the colors for the cardinal will be the same as displayed unless you specify differently. NO TEXT will be embroidered unless you specify it. You can specify what to embroider on the top and bottom of the Christmas ornament and the color of the letters. Please specify all uppercase letters as they embroider best at this size. Let us create a Christmas ornament for everyone on your Christmas gift list. Have a Merry Christmas! The embroidered Christmas tree ornament makes the perfect personalized Christmas gift. On this Christmas Tree ornament, the colors for the tree will be the same as displayed unless you specify differently. NO TEXT will be embroidered unless you specify it. You can specify what to embroider on the top and bottom of the Christmas ornament and the color of the letters. Please specify all uppercase letters as they embroider best at this size. Let us create a Christmas ornament for everyone on your Christmas gift list. Have a Merry Christmas! 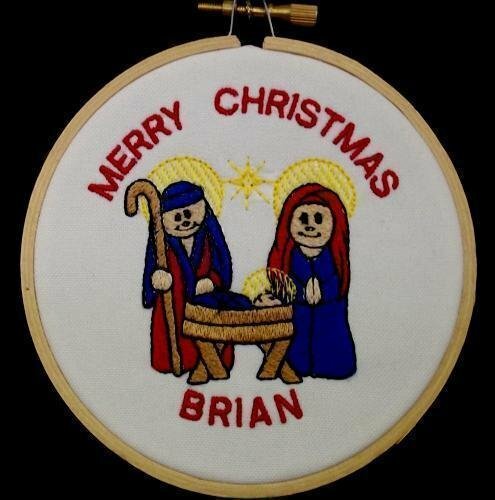 The embroidered manger Christmas ornament makes the perfect personalized Christmas gift. On this Christmas ornament, the colors for the manger will be the same as displayed unless you specify differently. NO TEXT will be embroidered unless you specify it. 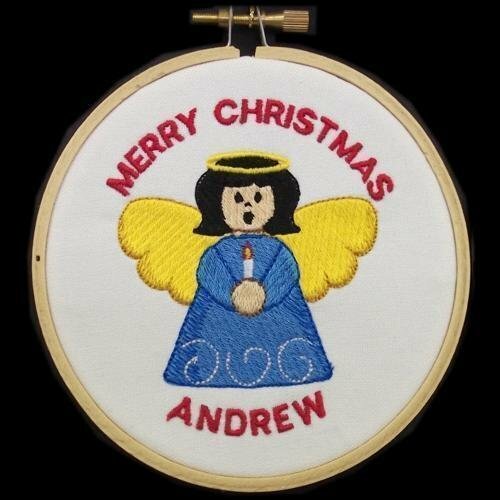 You can specify what to embroider on the top and bottom of the Christmas ornament and the color of the letters. Please specify all uppercase letters as they embroider best at this size. Let us create a Christmas ornament for everyone on your Christmas gift list. Have a Merry Christmas! 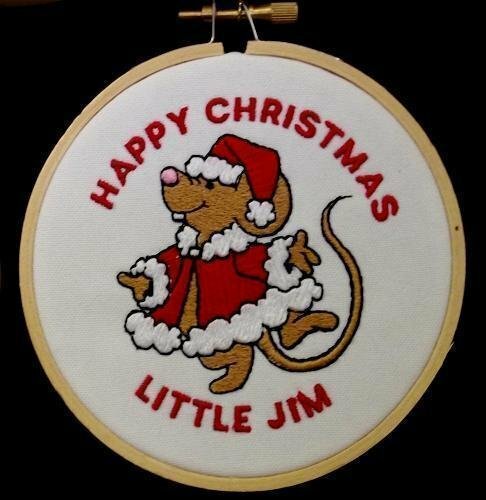 The embroidered mouse Christmas ornament makes the perfect personalized Christmas gift. On this Christmas ornament, the colors for the manger will be the same as displayed unless you specify differently. NO TEXT will be embroidered unless you specify it. 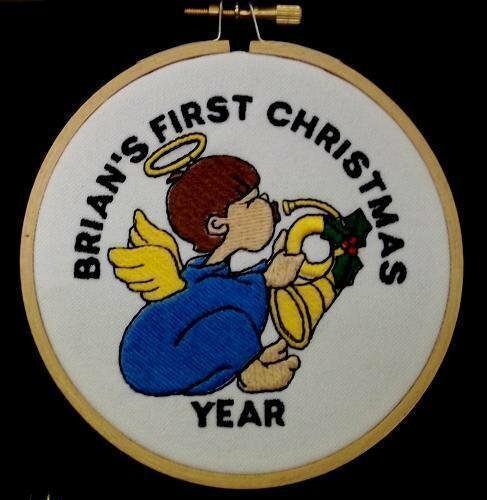 You can specify what to embroider on the top and bottom of the Christmas ornament and the color of the letters. Please specify all uppercase letters as they embroider best at this size. Let us create a Christmas ornament for everyone on your Christmas gift list. Have a Merry Christmas! 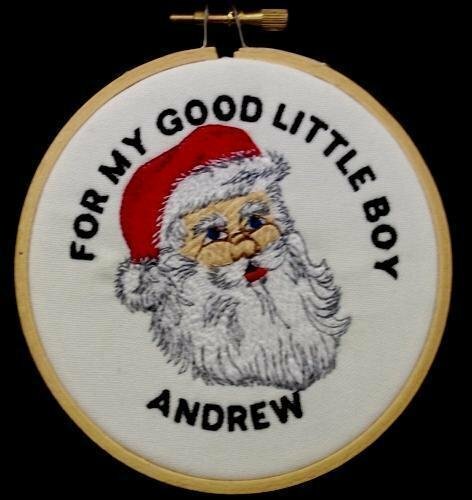 The embroidered Santa Christmas ornament makes the perfect personalized Christmas gift. On this Christmas ornament, the colors for the Santa will be the same as displayed unless you specify differently. NO TEXT will be embroidered unless you specify it. You can specify what to embroider on the top and bottom of the Christmas ornament and the color of the letters. Please specify all uppercase letters as they embroider best at this size. Let us create a Christmas ornament for everyone on your Christmas gift list. Have a Merry Christmas!